When you choose Palms Trading Company as your source for authentic Native American jewelry and pottery, we want to make sure that you enjoy your shopping experience and that you are satisfied with your purchase. Palms Trading Company has a wide selection of sterling silver and turquoise jewelry and Native American pottery on our website. But if you’d like to explore our larger in-store selection, which includes drums, moccasins and ceremonial replicas, you can find us in Albuquerque’s Old Town district on the southwest corner of 15th Street and Lomas Boulevard next to Monroe’s. Visit us online for driving directions and maps. 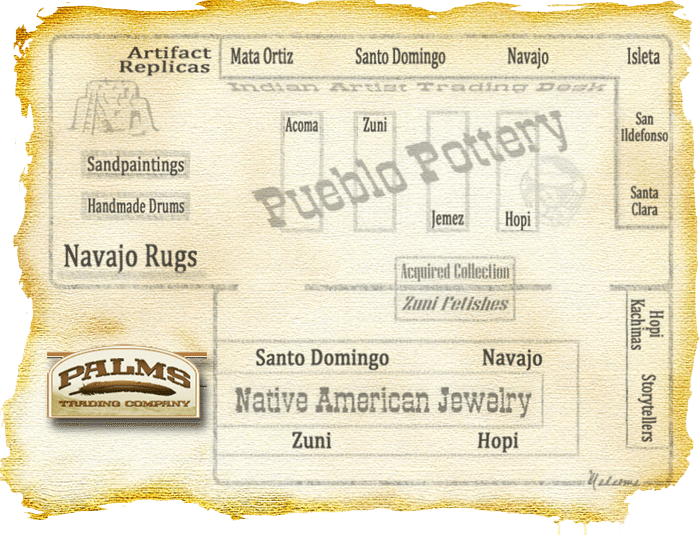 Our in-store selection is large but very well organized by type of art and Pueblo. Please let us know if you have difficulty finding something. If our current online or in-store selection doesn’t have what you’re looking for, our personal shopper program allows us to keep an eye out and notify you when something that meets your description comes in. Native American Indian jewelry with gemstones inlaid or set in bezels is created without gluing or soldering stones into place. If a stone has come loose or popped out, please bring your jewelry to Palms Trading Company for repair. If you are unhappy with your Palms Trading Company purchase, you may return it within ten days of purchase with the receipt and receive store credit. If you purchased an item online, please ship the item back to us in the original packaging, insured. If your item was broken during shipment, please take a photo of the item (because all shipments are insured) and contact us for instructions on filing a claim. If you have any questions about us, our artists or your purchased art, please contact us! We are happy to share our passion and our knowledge with you!